That’s wall with a capital “W” in the title; the Berlin Wall, to be exact. 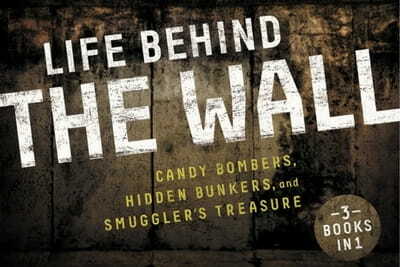 Life Behind the Wall is an action-packed trilogy that follows the adventures and misadventures of one family through the eyes of its teens. The complete story spans some fifty years but is broken into three novels, each fascinating on its own but definitely better together. In “Candy Bombers” we meet cousins Erich and Katarina, whose desperate attempt to find food in war-ravaged Berlin nearly lands them in a military prison, until a friendly U.S. reporter takes them under his wing. Set some 13 years later, “Beetle Bunker” features Erich’s little sister, Sabine, and her friend Willi, who watch the Berlin Wall go up from the wrong side of the fence . . . and stumble into what may turn out to be a way to freedom in the West. The story picks up almost 30 years after that in “Smuggler’s Treasure” when Sabine’s daughter is working on a school project that uncovers long-hidden family secrets. She joins forces with the American son of a U.S. Air Force officer to bring about an unexpected family reunion even as the Wall comes crashing down. If only regular history books were this much fun to read. All three stories are filled with engaging characters who give us a first-person view of a life most of us can only imagine. They show us what it was like to be a German after WWII, a kid suffering from the after-effects of polio, and a committed Christian who refuses to take an easy way out when it goes against his God-given calling. Along the way we learn about life behind the Iron Curtain, what it looks like to “honor your father and mother,” and so much more. The young people in the stories have plenty of adventures, from stowing away on airplanes to exploring bombed-out buildings to fighting a corrupt government, just to name a few. The span of years between stories means we see some characters (Erich and Sabine among them) as both teens and adults. That helps tie the stories together and answer the inevitable question of “what happened next?” History buffs will appreciate that these carefully-researched stories are based on fact; to make things perfectly clear each book is followed by a “how it really happened” section. Technically these are stories for “young readers” but adults will enjoy them as much as the kids. Parents and grandparents will have a different reading experience, since many will remember actually hearing President Reagan’s famous call to “tear down this wall,” just one of many real-life situations woven into the stories. That range of memories and points of view makes Life Behind the Wall a terrific choice for parents and kids to read and discuss together. There are even some fairly deep (but kid-friendly) questions at the end of each book. Main character status is pretty much equally shared between boys and girls, so both should enjoy these stories. There’s action, adventure, intrigue, bullies, plucky kids, and a satisfying ending. What more could a young reader (or even a not-so-young reader) want?